Fay Sho No. 7? Or No. 6? Looks brown in photo, but it is black. Part of the fun of buying an old typewriter is determining its vintage. Lately, I acquired a Fay-Sholes that does not display a model number. Typically, this is found on the paper table, a piece that is easily removed… and lost. My machine is certainly a Fay Sho — the type-basket shifts, not the carriage. However, though the paper table is present, my typewriter sports an eagle emblem, not the Fay-Sholes name. Fine lettering in the border of the emblem reads, “Made in U.S.A.” and “New York Import & Export” — I surmise the company exported these typewriters under its own name to Asia, where it had business interests. Regardless, my machine is most certainly a Fay-Sholes. Here is a Fay Sho No. 7, recently sold by Branford House Antiques. Note the model number is clearly displayed on the paper table. 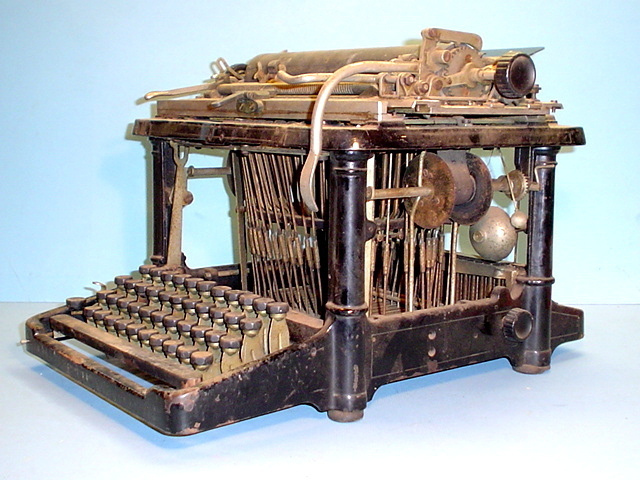 I found this image in a book on antique typewriters. I only have a few pages of the book, so I don’t know the title. Could it be REMINGTON-SHOLES, or is there only enough room for FAY- ? 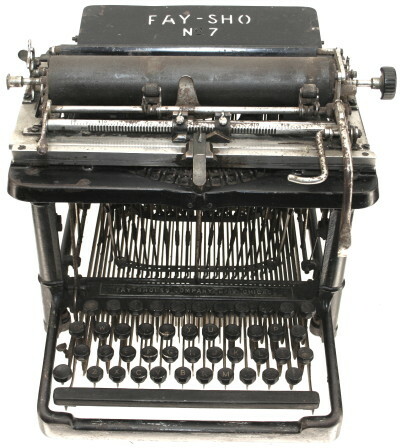 The book that you own only partially is Darryl Rehr’s Antique Typewriters and Office Collectibles. It’s definitely worth getting the whole thing. 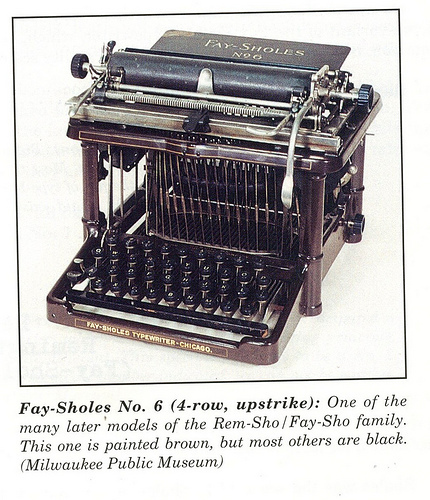 There is room for REMINGTON-SHOLES, but it appears FAY-SHOLES TYPEWRITER – CHICAGO. centers more evenly on the front piece, which is about 10 inches across. The first “e” in “typewriter” marks the half-way point on my machine, as it does in the words FAY-SHOLES TYPEWRITER – CHICAGO. I’d like to get a copy of Antique Typewriters and Office Collectibles, but I can’t find it for less than $50 on the Internet. Oh well, I will keep looking. The book has sold recently on eBay for $12 and $21. Next post: What does it mean to join the typosphere?